If you need a place to store all of your smaller tools and equipment in one place, or want to separate your materials by project, these coloured double door workshop cupboards are an ideal solution. In three bright colours, or classic grey, these cupboards are designed to blend with your current work shop set up and maximize your storage space. 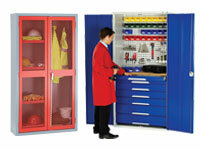 What is The Purpose of the Coloured Double Door Workshop Cupboards? Completely built out of industrial grade steel, these coloured double door workshop cupboards are completely customisable to your needs. Choose between six different sizes, four door colours, and any combination of drawers, shelves, and doors. It’s easy to create the perfect storage solution for whatever you need organised and secured. Because of the sturdy three point locking system and sturdy steel construction, these coloured double door workshop cupboards are the ideal place to protect your tools and equipment. The four colour choices make it easy to differentiate uses between cupboards and add colour to your existing workspace. Make these coloured double workshop cupboards mobile by adding a chassis for the low cabinets and keep your most needed tools close at hand, no matter where you are in your workshop. 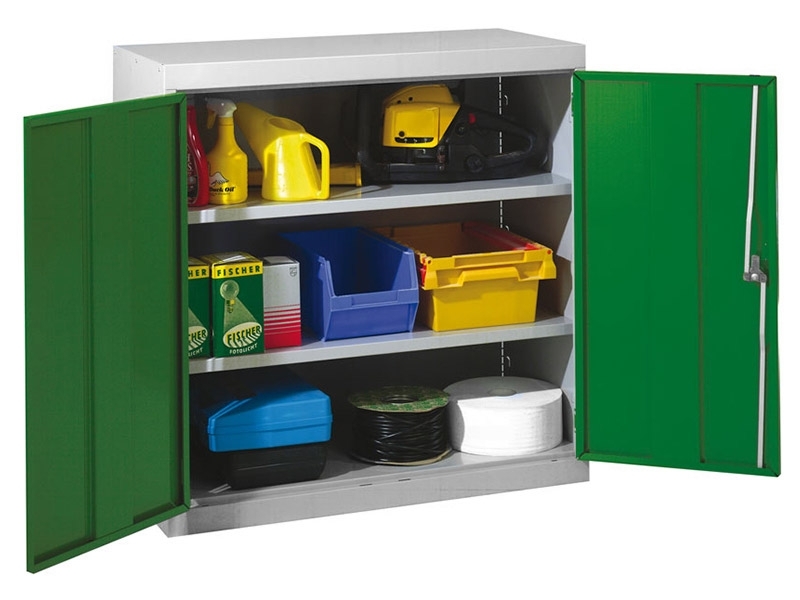 If you find yourself searching for misplaced tools, or need a place to organise all of your equipment, these coloured double door workshop cupboards are an ideal addition to your workspace. Utilise one or customise a whole set to perfect your work area and storage. Fully customisable with additional shelving, drawer units, or mobile chassis available. Choose between six sizes and four door colours. Epoxy powder coated steel construction in light grey.